For many years boaties from all over Australia, Brisbane, Sydney and Melbourne have been turning to Prowave ® for their Bait board needs. Over time, Prowave ® have kept increasing their range of aluminium bait boards to become the largest stockest of bait boards in Australia. With over 70 products in stock you can be out fishing with your new bait board in know time at all with same day dispatching on most items. 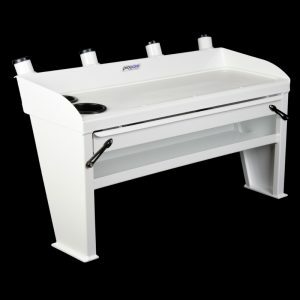 Below is one of the new models available, which includes both a storage shelf and a drawer for all your tackle needs. Find out full details here.